How would your life be different if your breath were more relaxed, more fluid—less disturbed by congestion, cough, stress, or anxiety—if you could simply breathe easy? Most of us can relate to the panic we experience when we can’t catch our breath for some reason. Inadequate respiration is a very real threat to our lives, so when we can’t breathe comfortably, our survival instincts kick in fairly immediately. But even seemingly benign disruptions in the respiratory pathways can have a significant impact on our overall health—especially over the long-term. Imbalances in the respiratory tract can strain both the mind and the physiology in any number of ways. When we truly can’t breathe, this stress becomes extraordinarily apparent to us. With more subtle imbalances, we may not be as consciously aware of the accumulating discord, but the impacts on the system as a whole remain. In many ways, breath is life. At the very least, it is essential to life. The respiratory system interacts directly with some of our most vital organs—the lungs and the heart, which are responsible for nourishing every cell and tissue throughout the body. And the Vedic tradition reminds us that the respiratory pathways are also closely tied to prana (the vital life force that is carried on the breath), as well as a number of subtle channels that are quite significant to our overall well-being. Caring for the respiratory pathways and addressing respiratory imbalances is therefore an incredibly worthwhile endeavor. It fact, doing so can be transformative. In the paragraphs that follow, we will explore the Ayurvedic perspective on the respiratory system, identify common imbalances that can befall it, and explore a number of different modalities for inviting a return to balance. If you feel that your life would change for the better if you could breathe a little easier—either physically or energetically—you’ve come to the right place. The Ayurvedic tradition has a lot to offer when it comes to inviting an easeful and nourishing relationship with the breath—and with the vital life force it circulates. According to Ayurveda, substances and energies move throughout the body via distinct channels—both physical and energetic—known as srotamsi. The respiratory tract (the nose, nasal passages, sinuses, trachea, and lungs) is all part of a single channel, known as prana vaha srotas (the channel that receives prana). This channel is very similar to the “respiratory system” of modern medicine, but its functions and significance are even more expansive. For example, prana vaha srotas includes the heart, and is also intimately connected to the digestive tract. We will explore these connections more carefully in a moment. First, let’s cover the primary functions of this essential bodily channel. The most essential function of prana vaha srotas is to circulate prana throughout the body. It is the river that nourishes every cell and tissue with the life-giving forces of prana, oxygen, and vitality. In this way, the lungs are quite literally breathing for every cell throughout the body. In Ayurveda, each of the primary channels in the body has a root (mula), a path through the body (marga), and an opening (mukha)—each of which can be meaningful to the process of restoring balance in a given channel. The root can hint at more subtle intricacies and interconnections within the channel system, while the opening is often used as a powerful access point for healing. Prana vaha srotas is simultaneously rooted in the heart and the digestive tract. Its path through the body is the respiratory tract—from the nasal passages, through the throat, trachea, bronchial tree, and the alveoli of the lungs. And its opening is the nose and the nostrils. Let’s take a moment to explore why these sites—the heart, the digestive tract, and the nostrils, in particular—are so important. As one might imagine, the heart is a critically important crossroads in the body, on physical, energetic, and emotional levels. In addition, it is the root, not just of prana vaha srotas, but of two additional channels that travel throughout the body: rasa vaha srotas (the channel for the plasma and lymph), and mano vaha srotas (the channel of the mind). In this way, the heart is grand central station for three of the most ubiquitous channel systems in our bodies—those that touch every cell and tissue within us. The heart is also the seat of ojas (the subtle essence of strength and vigor), an important emotional center, and home to the heart chakra. If you are interested in a more in-depth exploration of the significance of the heart center (as well as tips on how to care for yours), please explore our health guide: Vibrant Heart. For our purposes, suffice it to say that, being rooted in the heart, prana vaha srotas is deeply intertwined with a number of important physical channels, subtle pathways, and energy centers—making it a profoundly influential channel that is capable of affecting radical change throughout the mind body organism. Undoubtedly, this explains why working with the breath is one of the most universal foundations of spiritual practice around the world, across diverse religious traditions. And indeed, pranayama (yogic breathing practice) can help to promote balance both in prana vaha srotas and beyond (more on that below). The digestive tract is critically important in Ayurveda because it is the seat of agni (the sacred metabolic fire). Balanced agni is seen as the very cornerstone of health—and also the root of all imbalances and diseases. As such, the link between prana vaha srotas and the GI tract is significant. Agni is the fire of transformation, but it relies on the air that circulates in prana vaha srotas to fan its flames. Not only is prana vaha srotas essential to the health of agni, it also helps to govern the transformation of food into energy, consciousness, and vitality. Further, there is a particular connection that exists between the lungs and the colon.1 This is due, in part, to the functional integrity between the upward moving energy of exhalation (udana vayu), which is seated in the lungs, and the downward moving energy of elimination (apana vayu), which is seated in the colon. Tending to the imbalances in the colon can improve the functioning of the respiratory pathways, and vice versa. As the opening (mukha) of prana vaha srotas, the nose is quite important, therapeutically speaking. In fact, the nose and the nostrils are widely-used to balance the respiratory pathways. But the nostrils are also intimately linked to the subtle energetic pathways of the lunar and solar channels known as ida nadi and pingala nadi, respectively. This connection serves to illustrate the potency of addressing the respiratory pathways via the nostrils. The subtle effects can very easily reverberate throughout the system, whether we introduce a simple breathing exercise or apply an herbal oil to the nostrils. The Sanskrit word, khavaigunya means “weak space,” and it is used to describe any personal physiological vulnerabilities. A khavaigunya in your system could be the result of your unique genetic make-up, family history, past trauma, any unresolved emotions, an injury, or a past illness. Whatever the case, a khavaigunya usually leaves specific organs and tissues especially vulnerable, meaning that imbalances circulating in the body (such as excess vata, pitta, or kapha) can more easily lodge within these tissues, disrupting their proper functioning. When it comes to respiratory health, many of us have a very clear tendency to develop rather predictable imbalances in fairly consistent locations. Do you know to protect your lungs as soon as you have congestion—because you inevitably wind up with a stubborn, junky cough? Or perhaps it’s the sinuses that are your particular weak point. Whatever the case, these patterns are often indicative of a khavaigunya—which can certainly influence the respiratory symptoms we tend to develop. Other factors—like our constitution, current state of balance, age, stage of life, environment, and season—can also be involved, but it is worth paying attention to our personal vulnerabilities. Imbalances in the doshas are another important factor in respiratory imbalances. Excesses in vata, pitta, and kapha each affect the respiratory tissues in distinct but predictable ways. Knowing the general patterns of imbalance can help to inform more effective balancing strategies. Vata imbalances in the respiratory pathways can be caused by any influence that increases the qualities of vata in the body. These include the dry, light, cold, rough, mobile, subtle, and clear qualities. Dryness. Excess dryness in the nose, sinuses, throat, or lungs can lead to pain in the nasal passages, dry cough, and general irritation in the respiratory tract. Interestingly, if there is enough kapha in the body, the dry quality can also cause an increase in mucus production and congestion, which are the body’s natural defenses against excess dryness. Therefore, distinguishing congestion driven by excess vata from congestion driven by excess kapha is important, as they should be treated differently. If you do not feel clear about which dosha is behind your congestion, an Ayurvedic practitioner can help you make this distinction. Constriction. Excess vata tends to cause constriction in the tissues, which can lead to disturbances anywhere in the respiratory tract—in the nasal passages, the throat, or the lungs themselves. This type of contraction inevitably interferes with the flow of prana through the respiratory pathways and beyond. Balancing vata can help tremendously in relieving constriction throughout the body. Breathlessness. Excess vata in the respiratory tract is usually behind the feeling of breathlessness. Relief typically requires a particular focus on pacifying vata. Following a vata-pacifying diet can be tremendously helpful in calming vata, but there are also lifestyle strategies and herbs that will help eliminate excess vata from the system as a whole. For more specific guidance incorporating vata-pacifying practices, please see our resource on Balancing Vata. Balancing strategies for several common vata-type respiratory imbalances are discussed in detail below. In the following vata-pacifying recipes, the milk in the Golden Milk and the honey in Talisadi Licorice Tea act as carrier substances to take the herbs in these nourishing drinks deeper. At night, before bed (preferably at least 3 hours after dinner), add the dry herbs to the milk and bring to a boil. Simmer for a couple of minutes, remove from heat, cool, and drink. This golden milk is simultaneously lubricating and soothing, but also warming and clarifying, so it helps to balance excess dryness in the throat. Add the dry herbs to a cup of recently boiled water. Steep 10 minutes. Cool slightly, stir in the honey, and drink. You can also mix a larger quantity of the dry herbs ahead of time. In this case, add 1 teaspoon of the mixture per cup of water. This tea is warming, soothing, and detoxifying—perfect for balancing excess vata in the respiratory passages. Pitta imbalances in the respiratory pathways can be caused by any influence that increases the qualities of pitta in the body. These include the light, hot, sharp, liquid, oily, spreading, and subtle qualities. Irritation, itching, and redness. These are the typical signs and symptoms of inflammation, which can easily affect the nasal passages, mouth, throat, or lungs. Again, restoring balance will require pacifying pitta while offering appropriate support to the respiratory channels as a whole. Excess heat. Pitta’s intense heat is always at least partially involved when there is an imbalance. Respiratory imbalances accompanied by excess heat will respond best when some attention goes toward cooling, soothing, and eliminating excess pitta from the respiratory tract. Following a pitta-pacifying diet can be tremendously helpful in calming pitta, but there are also lifestyle strategies and herbs that will help eliminate excess pitta from the system as a whole. For more specific guidance incorporating pitta-pacifying practices, please see our resource on Balancing Pitta. Balancing strategies for some common pitta-type respiratory imbalances are discussed in detail below. Kapha imbalances in the respiratory pathways can be caused by any influence that increases the qualities of kapha in the body. These include the heavy, slow, cool, oily, smooth, dense, soft, stable, gross, and cloudy qualities. Excess mucus and phlegm. Mucus is naturally secreted by the mucous membranes to lubricate these delicate tissues. In proper quantities, it is a healthy expression of kapha dosha. But when kapha is elevated, mucus is often produced in excess. In these cases, pacifying kapha alongside support for the affected respiratory channels will help to expedite the healing process. Frequent congestion and a sense of cold in the body. Excess mucus and a sense of cold in the body go hand in hand. Because kapha is responsible for excess mucous production, which can dampen the digestive fire and strain the immune system, pacifying kapha can help to reduce the frequency of illness and restore proper immunity. Swelling and water retention. Kapha tends to be slow, stagnant, and watery, which can easily cause swelling and water retention anywhere in the respiratory tract. When these symptoms are present, pacifying kapha and supporting the elimination of the excess fluid will support proper healing. Stagnation. Kapha is a naturally stabilizing force in the body. Unfortunately, too much stability can lead to stagnation, which is never healthy. Stagnation in the respiratory tract quickly becomes a breeding ground for unwelcome microbes and can lead to other imbalances. Pacifying kapha increases warmth and circulation, which can help to restore the proper flow needed to clear stagnation from the body. Following a kapha-pacifying diet can be tremendously helpful in eliminating excess kapha, but there are also lifestyle strategies and herbs that will help clear excess kapha from the system. For more specific guidance incorporating kapha-pacifying practices, please see our resource on Balancing Kapha. Balancing strategies for several common kapha-type respiratory imbalances (like sinus congestion) are discussed in detail below. The honey in the following recipe acts as a carrier to deliver the herbs deep into the respiratory tract. Stir the dry herbs into the honey and eat slowly. These herbs help to warm the body and clear excess kapha from the respiratory tract. This mixture can be taken two to three times per day to clear excess kapha from the respiratory tract. What follows are a number of therapeutic strategies for supporting the respiratory pathways. First, we will focus on practices that support the respiratory tract as a whole, regardless of whether you are currently aware of any imbalances. Then we will explore more specific experiences—first in the upper respiratory tract (nose, sinuses, and throat) and then in the lower respiratory tract (lungs). In this way, you can easily navigate directly to the sections that are most relevant to you. Please keep in mind that, while these practices will certainly support your body’s natural intelligence and the flow of prana throughout your being, they are in no way meant to serve as a replacement for the personalized medical advice of your physician. Some respiratory imbalances can be quite serious and are deserving of swift medical attention. If you have a serious respiratory condition, please talk with your doctor before implementing any new therapeutic strategies. This first set of therapeutic strategies supports the health and functioning of prana vaha srotas as a whole. Use the descriptions below to help you to determine which practices would be most beneficial for you. Remember, the respiratory channels are deeply connected to the heart center, the subtle body, and the mind; it is therefore very important to pursue practices that resonate with you and that you enjoy. As we have briefly discussed, prana, the vital breath, is the subtle essence of the life force that animates each of us. It infuses every cell and tissue throughout our bodies and is carried on and stimulated by the breath. Taking in fresh prana kindles agni, restores fluidity and vitality to the subtle energy channels of the body, releases accumulated tension, supports the nervous system, and helps to balance prana vaha srotas—all while digesting and eliminating stagnation and ama (toxins). The practice of pranayama (yogic breathing exercises) is one of the best ways to bathe our tissues in fresh prana. Pranayama encourages the conscious movement of both breath and prana throughout the respiratory channels and beyond. It also provides a tangible practice where the subtle and gross channels, mind and body, head and heart can intersect and work together. Just ten or fifteen minutes daily can be transformative. If working with the breath is relatively new to you, begin with Full Yogic Breath to ensure that you are breathing correctly. This pranayama is the foundation of all others. It teaches us how to work with the fullness of the breath and can help to clear out dysfunctional patterns in the respiratory pathways such as shallow breathing or chest-breathing (i.e. not moving much breath into or through the belly). Ideally, the breath should move fluidly—from the pelvic floor throughout the torso. Full Yogic Breath teaches us to breathe correctly and to consciously direct the breath as we do so. This practice is also known as Nadi Shodhana, which in Sanskrit means, “channel cleansing.” It is wonderful for reducing stress and supporting balance throughout the respiratory pathways. This pranayama activates many of the subtle channels that are rooted in the heart—including prana vaha srotas, mano vaha srotas (the channel of the mind), ida nadi (the lunar channel), pingala nadi (the solar channel), and sushumna nadi (the central channel). As a result, it calms and purifies the mind, clears accumulated tension, and supports an improved mental disposition in the face of everyday stressors. It is also particularly useful with hay fever, wheezing, or sneezing.2 If you prefer a guided practice, consider Dr. Claudia Welch’s Prana CD, which includes a beautiful, hands-free version of alternate nostril breathing. The practice of yoga inherently activates and supports balance throughout prana vaha srotas, particularly when our practice involves a conscious awareness of and relationship to the breath. Asanas that stimulate the lungs and the heart center are especially helpful—poses like Cat-Cow, Chair, Warrior II, Side Angle, Cobra, Locust, Bow, Bridge, Half Shoulder Stand, and Cow’s Face. You can also tailor your routine by practicing dosha-balancing yoga, which incorporates the principles of Ayurveda to more specifically balance vata, pitta, and kapha. There are a number of herbs in the Ayurvedic pharmacopoeia that offer tremendous support to prana vaha srotas. Some have a direct affinity for the respiratory passageways. Others help to kindle agni and support health in the digestive tract (which, remember, is part of prana vaha srotas). You can take these herbs with a carrier substance (anupan). Ayurveda's Carrier Substances guide will help you determine which anupan is appropriate for your needs. The following herbs offer overall support for a healthy and functioning respiratory system. Triphala is revered for its unique ability to gently cleanse and detoxify the digestive tract, while replenishing, nourishing, and rejuvenating the tissues. It encourages balanced agni throughout the system, helps to eliminate ama, supports ojas, and therefore lends strength to the respiratory pathways. About half an hour before bed, take two Triphala tablets with a glass of warm water. If you prefer, steep ½–1 teaspoon Triphala powder in a cup of freshly boiled water for ten minutes. Cool and drink. Or try thirty drops of Triphala liquid extract in warm water before bed. Amalaki tablets can be taken instead of triphala for anyone with excess heat in the digestive tract, or excess pitta anywhere in the body. Amalaki is one of the three herbs in triphala and is also a highly concentrated source of antioxidants. As such, it is a potent rejuvenative that nourishes the tissues, gently removes natural toxins, supports the immune system, and helps to balance prana vaha srotas. Take one to two tablets, once or twice daily, or as directed by your health practitioner. If you prefer, amalaki is also available as a powder or a liquid extract. Chyavanprash is a traditional Ayurvedic herbal jam made in a base of amalaki fruit. This balancing formula kindles agni, helps to buffer the body against stress, and bolsters the immune system. As such, it can help to foster clarity throughout the respiratory passages. A daily dose of this nutritive jam can support energy, vitality, and overall well-being. Take 1–2 teaspoons daily, or use as directed by your health practitioner. Sitopaladi is a traditional Ayurvedic formula aimed primarily at bolstering the immune system. It supports the proper functioning of the lungs and sinuses, encourages healthy expectoration, kindles the digestive fire, and helps to burn excess kapha. This formula also helps to eliminate excess vata, pitta, and kapha from the head and chest, thereby promoting clear, healthy respiration. Take ¼–½ teaspoon Sitopaladi powder with warm water once or twice daily, or as directed by your health practitioner. Talisadi is a traditional Ayurvedic formula that contains all of the ingredients in Sitopaladi, with the addition of talisa, black pepper, and ginger—making it more heating. Talisadi is revered for its ability to kindle the digestive fire, burn ama (natural toxins), support the maintenance of a normal body temperature, and bolster the immune system overall. This formula also has a particular affinity for the lungs, making it wonderfully supportive of healthy respiration. Take ¼–½ teaspoon Talisadi powder with warm water once or twice daily, or as directed by your health practitioner. The upper respiratory tract includes the nose, nasal passages, sinuses, larynx (throat), and trachea (windpipe). Its job is to filter, moisten, and warm air on inhalation—as it is delivered to the lungs—and on exhalation, to transport air from the lungs to the exterior of the body. If you frequently develop respiratory imbalances in the nasal passages, sinuses, or throat, the following strategies will likely be especially supportive in your process of returning to balance. We will begin with general support for the upper respiratory tract and then focus on how to balance a few common ailments in this region. The prana-carrying channels of the head and neck support the overall function of this region of the body, which is associated with clarity, insight, intelligence, communication, and self-expression. These faculties work best in concert with the rest of the body, and with the heart center. If you feel overly identified with or cut off from any of these aspects of your being, it may be helpful to take a deeper look at why. As a starting point, the following therapies will offer general support to the upper respiratory tract. Treating the delicate tissues of the nasal passages directly can be quite powerful because of their connection to ida and pingala nadis. Nasya and Neti both support clear breathing and a clear mind, but their effects are entirely different. Please read the descriptions below to help you determine which one might best support you. If you still feel unclear, you can experiment with both and decide which you like better. It may be that one is simply a better fit for you. But if you like them both, it is important to understand that these therapies introduce somewhat opposing energies, so they are best practiced separately. You can alternate by day, by season, or by symptom—according to what works best for your body. Nasya is the practice of applying an herbalized oil to the nasal passages in order to soothe, lubricate, and rejuvenate the delicate mucous membranes of the nose. Nasya promotes unobstructed breathing, relieves accumulated stress, and supports mental clarity, while providing a useful barrier against airborne foreign substances (like dust and pollen). Lubricating the nasal passages is also said to improve the quality of the voice and to strengthen vision. Our Nasya Oil is tridoshic. Nasya should not be performed by pregnant or menstruating women. If this practice is new to you, please watch our short instructional video. Nasal rinse, also known as neti, consists of pouring warm salt water through the nasal passages. This practice moistens the mucous membranes and cleanses the nasal passages of dust, dirt, pollen, other allergens, and excess mucus. Neti pots are designed specifically for this practice, and Natural Mineral Salt can be used to make the saline solution.  If you find that your nasal passages feel dry afterwards, or if you want to create a natural barrier against dust, dirt, pollen, and other airborne particles, you can use your pinky finger to lubricate the nostrils with a bit of sesame oil or ghee—either immediately after neti, or at another time of day. If using a neti pot is new to you, please watch our short instructional video. Bhramari Pranayama, also known as Humming Bee Breath, is a deeply calming breathing practice that offers tremendous benefits to the head, neck, and throat. This pranayama soothes the nervous system, calms and quiets the mind, releases cerebral tension, bolsters the health of the throat, strengthens and improves the voice, encourages sound sleep, and is deeply supportive of healing and rejuvenation. For instructions on how to practice, please see our resource on Bhramari. Ujjayi Pranayama, also known as the Breath of Victory, is a widely used tridoshic pranayama in the yogic tradition. It is performed with a slight constriction at the back of the throat, which activates and strengthens the throat center. Ujjayi pranayama is mildly heating, deeply tranquilizing, and can be very helpful in correcting upper respiratory imbalances. In addition, it slows the pace of the breath, cleanses and refreshes the subtle channels of the body, invigorates the being with fresh prana, dissipates tension, helps to release stagnant emotions, improves mental clarity, and supports sound sleep—all while soothing and rejuvenating the nervous system. Asanas that activate the throat, neck, and head help to improve the flow of prana through these regions and can help to restore balance in this area. In particular, Lion Pose (Simhasana) and Standing Forward Bend (Utanasana) are highly beneficial when there are imbalances in the upper respiratory tract. Lubricate the Nostrils with Oil. Simply massaging the nostrils with an appropriate oil can be wonderfully supportive. You can use your pinky finger to massage sesame oil or ghee into the inner wall of the nostrils. Incidentally, the massage itself can help to relax the tissues and the musculature, releasing constriction, which is also a common sign of excess vata in the tissues. Nasya. This practice of applying herbalized oil high into the nasal passages (as described above) can also be very helpful because it delivers the oily quality directly to prana vaha srotas. Ingest More Oil. You can complement your efforts by following a vata-pacifying diet and specifically, by increasing your dietary intake of high quality fats. Ingesting organic oils like ghee, olive oil, coconut oil, and sesame oil will help to lubricate both the digestive tract and the tissues throughout the body, while calming vata systemically. Ayurvedic Self-Massage with Oil. Similarly, a self-massage with oil is highly vata-pacifying and will also offer deep nourishment, rejuvenation, and lubrication to all of the bodily tissues. Be sure to include the inner wall of the nostrils as part of your massage. For more detailed instructions and guidance choosing an appropriate oil, please see our resource on Ayurvedic Self-Massage. Ginger Tea. A tea made from fresh ginger root liquefies kapha, kindles the digestive fire, and clears ama from the system. Bring your water to a boil and simply add about 1 teaspoon of chopped or grated ginger root per cup of water. Simmer for about 10 minutes, cool and drink. Gentle Exercise. During a challenging time, it is also important to rest and give the body adequate time to recover. Mild forms of exercise, such as gentle yoga or a relaxed walk are the most supportive. Vigorous exercise is best avoided. Listen to your body and give it plenty of time to rest and recuperate before pushing yourself physically. Healing Pranayama. Bhastrika can very effectively help to burn up congestion.3 This breathing practice is deeply detoxifying and very helpful in clearing excess mucus from the respiratory passages. Mix the dry herbs ahead of time and store in a small jar. 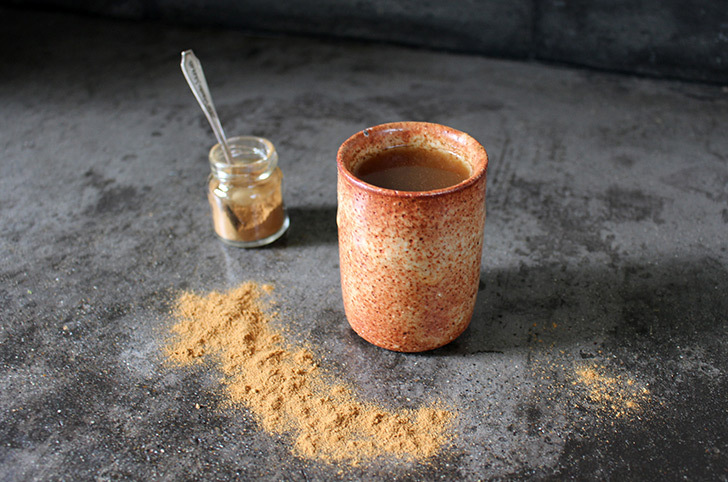 When you are ready to prepare your tea, steep 1 teaspoon of this herbal mixture in a cup of freshly-boiled water for 10–15 minutes, cool slightly, add ½–1 teaspoon honey, and drink.4 This tea helps to warm the body, encourages proper circulation, kindles agni, and bolsters the elimination of natural toxins. It is very supportive of the body’s natural healing process. If you tend to struggle with sinus congestion, or frequently endure a sore throat, see the next two sections for additional therapeutic strategies. Congested sinuses are no fun. Supporting their natural healing process often requires more focused support. In addition to the above suggestions, you might also try any of the following therapeutic strategies. Saline Drops. When the sinuses are particularly aggravated, it may not be possible to perform neti with a nasal rinse cup, as you normally would. However, a modified nasal rinse can help to thin the mucus and support clear breathing. Dissolve ½ teaspoon Natural Mineral Salt in ½ cup warm water (no hotter than body temperature). Tilt the head upside down and use an eyedropper to insert about 5 drops of this solution into each nostril, sniffing it upward and inward.5 This process can be repeated several times each day. Garlic Drops. For more powerful support, use a garlic solution instead. This method is certainly more intense, but it very effectively liquefies accumulated kapha, and increases heat and circulation in support of clear breathing. Peel a small clove of garlic, press it open with the flat side of a knife (chopping it will make the solution too concentrated), and let it sit for about ten minutes. Then place the garlic in a small bowl, add two ounces of recently boiled water, and let it steep for another ten minutes (no longer, or the solution will become too concentrated). Strain, and pour the garlic water into an eye-dropper bottle. Cool further, if necessary. When ready to use, lie down on a flat surface, tilt the head back, and place just one to two drops in each nostril, leaving the head tilted back for a couple of minutes and allowing the garlic to work its way into the upper nostrils. This solution keeps for several days at a time, and you can easily warm the garlic water before each use by bathing the dropper-bottle in hot water for a minute or two. Herbal Steam.6 Breathing steam infused with warming, clarifying oils or herbs—like eucalyptus and ginger—can also help to support clear breathing and normal sinus pressure. Boil about a cup of water, add 3–5 drops of eucalyptus oil, and place this water in a bowl. Using a towel to cover your head, lean over the bowl and inhale the steam for five to ten minutes. If you prefer to use ginger, place about 1 inch freshly chopped ginger root (or ½ teaspoon Ginger powder) in a cup of water and boil for several minutes. Place the ginger water in a bowl, cover your head with a towel, and breathe the steam for five to ten minutes, as above. 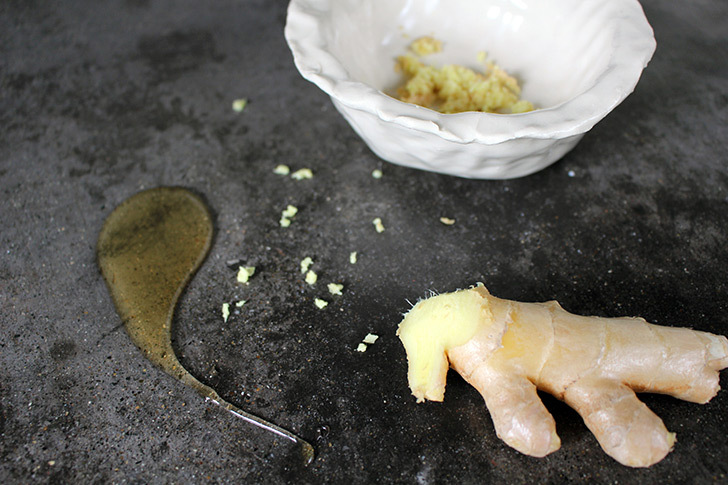 Stir a healthy pinch of fresh ginger root (or a few drops of fresh ginger juice) into the honey. Take this mixture two to three times per day.7 Fresh ginger is heating, detoxifying, encourages circulation, and very effectively liquefies kapha. Honey is similarly heating, scraping, detoxifying and kapha-pacifying. Together, they offer powerful support for sinus health. An uncomfortable throat usually involves both kapha and pitta—kapha as the source of mucus disturbing the throat, and pitta as the heat and irritation that follows. The strategies below help to clear the excess pitta and kapha in support of the natural healing process. Avoid Dairy. Dairy products like yogurt, cheese, and ice cream tend to aggravate the underlying imbalance when there is an uncomfortable throat. Staying clear of dairy entirely is a good idea. 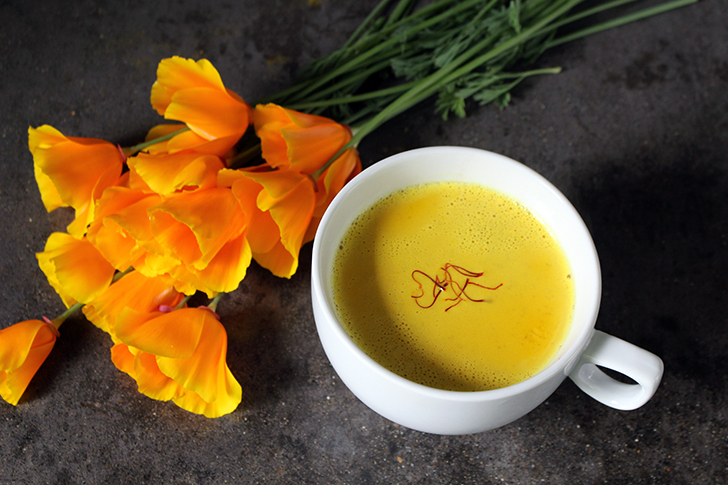 Although some find that hot turmeric milk supports healing, this is an exception to the rule. Pranayama and Yoga. Bhramari pranayama and Lion Pose both serve to soothe and strengthen the tissues of the throat while encouraging the flow of prana in this region, which naturally supports healing. Gargle. A mixture of ½ teaspoon Turmeric powder and ½ teaspoon Natural Mineral Salt in a cup of warm water soothes the tissues of the throat and encourages natural healing.8 Simply make a fresh batch of this mixture in the morning and evening, take a sip, gargle for a few moments, and spit. Repeat until you have gargled the entire cup of solution. Mix the dry herbs ahead of time and store in a small jar. When you are ready to prepare your tea, steep 1 teaspoon of the herbal mixture in a cup of freshly-boiled water for 5–10 minutes, cool slightly, and drink.9 This tea soothes the tissues of the throat while liquefying kapha, warming the body, encouraging proper circulation, kindling agni, and bolstering the elimination of natural toxins. Drink two to three times per day, or as needed. The lower respiratory tract includes the lungs (the bronchial tree and the alveoli). Its job is to carry out the exchange of oxygen and carbon dioxide with the capillaries that surround the alveoli of the lungs. If you frequently develop respiratory imbalances in the bronchial tree or lungs, the following strategies will likely be especially supportive in your process of returning to balance. We will begin with general support for the lower respiratory tract and then focus on how to balance a few common ailments in this region. The lungs support the overall functioning of the chest region, which is profoundly important to both our physical and emotional health. Closely tied to the heart (and all of the subtle energetic pathways contained therein), the lungs are also the emotional seat of dignity, delight, joy, lightness, grief, and sadness. Attending to the full range of these emotions—ensuring that they are properly felt and moved through—undoubtedly bolsters the health of the lungs. The sour taste also has a strong affinity for the lungs, so using sour foods in an appropriate way for your constitution and current state of balance (take our Ayurvedic Profile™ quiz if you don't know yours), and season can also benefit the lungs. In most cases, this means adding a subtle presence of the sour taste to your meals in a way that awakens the digestive capacity, enhances the appetite, and heightens the sense of taste without creating any symptoms of excess. You can learn more in our resource on the sour taste. Bhastrika pranayama is powerfully supportive of the lower respiratory tract as a whole. It kindles agni, balances excesses in the doshas, burns ama, cleanses and rejuvenates the lungs, and tones the muscles of the heart, bronchial tree, diaphragm, and abdomen. As with most pranayamas, bhastrika is best practiced on an empty stomach. Please click on the link above for more complete instructions (and a list of contraindications) for this practice. Any asanas that increase the flow of prana in the lungs and the heart will help to balance the lower respiratory tract, and there are many options. In particular, standing poses like Warrior I, Warrior II, and Reverse Warrior, and standing twists like Revolved Chair, and Revolved Side Angle are beneficial. Flows like Sun Salutation and Moon Salutation can also be very supportive. Lung Formula is a potent tonic for the respiratory system, containing a number of herbs with a specific affinity for the lungs. This formula cleanses, nourishes, and rejuvenates the tissues of the lungs, removes excess kapha from the respiratory tract, soothes and relaxes the muscles and tissues of the prana-carrying channel, bolsters the body’s natural defenses, and supports clear and comfortable breathing. Pippali is a powerful rejuvenative herb with a strong affinity for the lungs. It is a close relative of black pepper and is similarly pungent and heating. Pippali kindles agni, burns ama, and supports healthy digestion, while tonifying the lungs and supporting clear and comfortable breathing. Add the dry herbs to a cup of recently boiled water. Steep 10 minutes. Cool slightly, and stir in the teaspoon of honey. Drink twice a day.10 This tea is heating, clarifying, and detoxifying. It helps to remove excess kapha from the respiratory tract and very effectively kindles agni. Add the dry herbs to a cup of recently boiled water. Steep 10 minutes. Cool and drink. You can also mix a larger quantity of the dry herbs ahead of time. In this case, add ½ teaspoon of the mixture per cup of tea. This tea is warming, clarifying and deeply soothing to the respiratory tissues. Yoga and Pranayama. Specific yoga poses that help to support a return to balance include Thunderbolt (Vajrasana), Bow, Cobra, and Half Shoulder Stand.12 In addition, Bhastrika pranayama can be particularly supportive. Stir the dry herbs into the honey and eat. Pippali is a powerful rejuvenative for the lungs and the respiratory tract and bay leaves are tridoshic, warming, soothing and drying. This mixture can be taken two to three times per day. The Importance of Healthy Digestion introduces the concept of agni and offers an in-depth exploration of the importance of tending to yours. Our Guide to Healthy Elimination is often quite relevant due to the natural connection between lung and colon health. Plus, in Ayurveda, the prana-carrying channel includes the entire digestive tract. 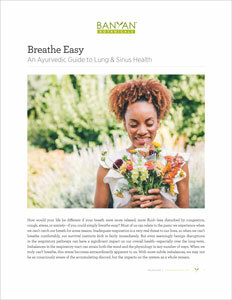 Allergy Free: An Ayurvedic Guide to Balancing Allergic Reactions looks more specifically at the Ayurvedic approach to balancing allergies. If allergies are a factor in your respiratory ailments, you might appreciate the additional information in this resource. Building a Healthy Immune System can inform a natural approach to bolstering immune health naturally. An Ayurvedic Guide to Stress Management offers fantastic tools for reducing stress and for changing our relationship with stressful situations. If stress is a predominant force in your life, this resource might very well support your healing process. Our Cleansing Department offers a diverse array of cleansing techniques and detailed instructions on how to do a home cleanse at a time that is right for you. One of the most inspiring things about the Ayurvedic tradition is that it’s all about finding your own unique path toward healing. The journey starts by taking into account your constitution and your current state of balance (the Ayurvedic Profile quiz will help you determine yours), your stage of life, your climate, the season, and your particular strengths and weaknesses. We’ve covered a lot of information here, but when it comes to choosing the particular avenues that will best support your return to balance, you can very likely trust your heart and your gut (which are both part of prana vaha srotas, after all). Keep in mind that healing is not about doing everything under the sun that could possibly improve your situation. Rather, it’s about finding a few potent remedies that resonate deeply with you, tuning in to observe how exactly they support you, and making whatever adjustments feel appropriate along the way. If you find yourself wanting more personalized support, an Ayurvedic practitioner can be invaluable in guiding the healing process. As you consider your path forward, take a deep breath. Feel your entire being nourished with prana. Then exhale, and fully release any tension you might be holding about healing your respiratory system. This process is about coming into alignment with ourselves, finding our inspiration, and trusting the journey before us. Go slow. Focus on what matters to you. We hope that you are breathing easier already, and we look forward to continuing to support your journey toward vibrant health and well-being. Do you suffer from allergies in any way? Perhaps you’ve come to dread the arrival of springtime because of the degree to which your allergies overtake your life. Unfortunately, many of us feel utterly helpless when it comes to changing our allergy experience in any real or meaningful way. 1 Vasant Lad, Textbook of Ayurveda Volume 1: Fundamental Principles of Ayurveda (Albuquerque: The Ayurvedic Press, 2002), 188. 2 Vasant Lad, The Complete Book of Ayurvedic Home Remedies (New York: Three Rivers Press, 1998), 121. 5 Lad, Home Remedies, 249-50. 8 Lad, Home Remedies, 255. 10 Lad, Home Remedies, 132. 12 Lad, Home Remedies, 133. 16 Lad, Home Remedies, 158-59.